I mentioned last week that we have entered the cold snap. With very little warning the weather went straight from balmy October to frosty November. One day I will be prepared for the cold snap, but not this year. I managed to find enough hats from last year for everyone to have cosy heads and ears, and several mittens and gloves (not pairs, that would be a stretch, besides, the kids like to wear theirs mismatched), and while I have a small mountain of scarves and shawls, my son did complain that he didn't have a scarf. I've never been that keen on scarves on small children. Scarves are easily lost, and the ends mean that they pose a choking risk, so I decided that maybe a little cowl knitting was in order. 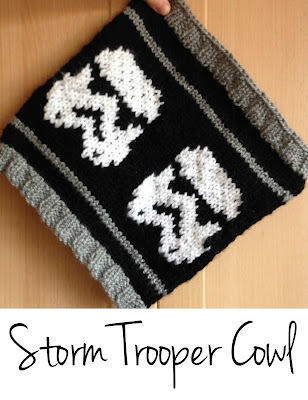 When asked, my son said he wanted the cowl to have Star Wars motifs on it, so I spent Monday morning searching Google images for something appropriate. There were a lot of options - there is definitely a large crossover between the knitting and Star Wars communities - and I decided to go for a Storm Trooper motif as they looked most distinctive (and only required two colours of yarn per row, which makes the knitting a lot easier). The cowl was a completely improvised work. I used chunky weight yarn from stash (mostly King Cole Big Value Chunky), and aimed for a circumference a little larger than my son's head, and to make the cowl long enough that it could be squished down round his neck for extra cosiness. Here's my *amazing* sketch. Yes, the Storm Troopers do look rather like potatoes wearing sunglasses. The knitting was quick and moderately easy. I cast the cowl on at lunchtime on Monday and had cast it off by the end of the day. I will confess that the Storm Troopers were a bit of a pain. Some of the blocks of colour were very wide so I had to catch several of the floats more than once between colour changes. But actually I quite enjoyed the knitting (and the lack of ends - I'm used to intarsia, which creates so many ends!). And here is the finished cowl. My son is delighted with it, and delightedly wore it to school yesterday. If you fancy making your own, I've made a project page for it on Ravelry where you can find all the details.